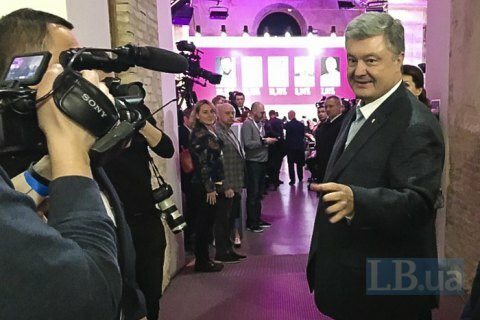 President Petro Poroshenko has thanked voters for support in the first round of the presidential election and expressed support for its steep increase in the runoff on 21 April. He was commenting on the initial exit poll results which placed him after comedian Volodymyr Zelenskyy. The president described the election as European-style and democratic. "We had even fewer complaints today than in 2014," he said. However, he added, the competition among candidates was much hotter than "at any previous presidential election". "I would like to thank the voters who very quickly figured out the intricacies of the 39 candidates and, without waiting for the runoff, firmly supported Ukraine's accession to NATO, already now firmly supported our course for EU membership and final independence from the Russian Federation," he said. He expressed hope that the number of his supporters would increase "exponentially" before the runoff. "You foiled the Russian scenario of the first round. Because they clearly did not want to see Poroshenko in the runoff. They failed," he said. He also accused Ukrainian TV channels of "spreading the most cynical concoctions of the Kremlin propaganda" in the weeks before the election. He said that the fact that his support dwindled from 54.9% in 2014 to 18-19% in 2019 was a "tough lesson" for him and his team.